One Owner, Local, Trade-in, Low Mileage! It's no surprise that the Ford Focus is one of the best-selling cars in the world. It has everything you could want in an affordable compact in one attractive package. Whether you're drawn to its charming styling, comfortable cabin, or European-developed chassis, the Focus has something for everyone. It's not only comfortable and good on gas, but it's a blast to drive thanks to its eager drivetrain and agile handling. The dependable Focus offers the most bang for the buck in its competitive segment. This low mileage hatchback has just 40205 kms. It's ruby red metallic tinted in colour. It has an automatic transmission and is powered by a 160HP 2.0L 4 Cylinder Engine. Our Focus's trim level is Titanium Hatch. The Titanium trim pushes this Focus into luxury territory. Its high-end features include heated front seats, SYNC with MyFord Touch, and 8-inch touchscreen, Bluetooth, SiriusXM, two USB ports, and Sony 10-speaker premium audio, dual-zone automatic climate control, a rearview camera, aluminum wheels, fog lamps, and much more. 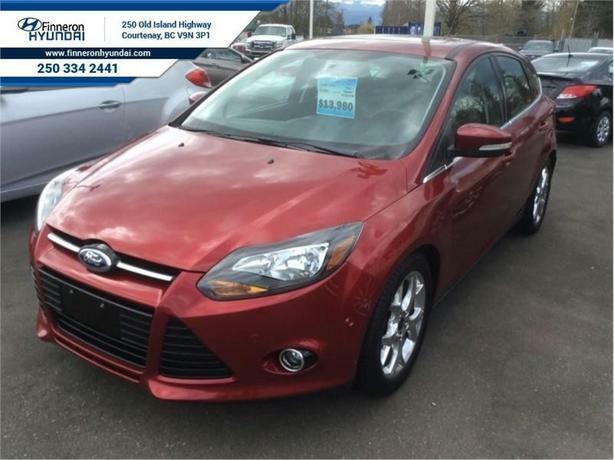 This 2013 Ford Focus is for sale today in Courtenay. To view the original window sticker for this vehicle view this http://www.windowsticker.forddirect.com/windowsticker.pdf?vin=1FADP3N29DL316600. Buy this vehicle now for the lowest bi-weekly payment of $87.47 with $0 down for 84 months @ 5.97% APR O.A.C. ( Plus applicable taxes - Plus applicable fees ). See dealer for details.